What Should I Gift You This Diwali? The most auspicious festival of the Hindu calendar is just around the corner. The occasional meet-ups with relatives and friends ensemble in a flurry. The home-sweet-homes get immersed in terrific illumination. Buaji from Jalandhar or Monty from Kanaada, this festival makes sure that you catch up with your near and dear ones! Hit the road and distribute gifts, appreciating the noise and festivities in the city meanwhile (I do). Posting <Happy Diwali, folks> via social media won’t cut it. The only memories of the festival as a kid include brainstorming novel ways to burst crackers. Yet, the mood of the festival seems to be changing every passing year. The young generation prefers virtual fireworks instead. Maybe they’re concerned about the environment. I somehow liked the smell and atmosphere of the D-day. Besides, the smoke apparently helped curtail the menace of dengue and malaria in the city! Diwali is the only time when I don’t get excited seeing this! The modern Diwali is not the simple & happy affair anymore. To avoid getting stuck in quagmires of workload, prioritize! Take the help of an MBA if need be. Prepare separate lists according to the perceived importance of people you intend to meet. 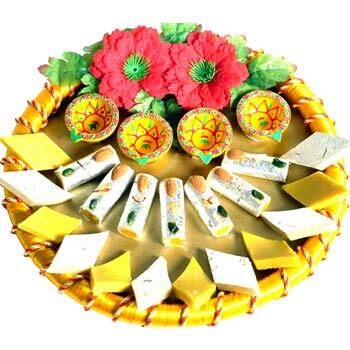 Then you need to assign the respective gifts; boxes of chocolates,sweets,dry fruits etc. in the correct order. The list gets updated on a rolling basis, as the gifts continue to arrive. Be extra careful when it comes to the VIPs (the same detestable gift item should not be stuck in an infinite loop, be brave and break the chain). Yes, you can present that electric kettle to Sharmaji. He won’t mind, apparently. Don’t forget to plan an elaborate route to cover out the whole city using the least amount of petrol. Do not take the help of any engineering student, even if need be. Do your homework. Also try to find out the exact time when an irksome friend/relative is least likely to be present at home. This will save you precious time, and you’ll be spared of having naashta the nth time. I love Diwali, but don’t like most of the artificial lighting that accompanies. If you really want to make this Diwali memorable, do something worthwhile. Buy a gift that nobody intends to forward. This entry was posted in Off the track and tagged city celebrates diwali, diwali gifts, gift reuse, happy diwali, modern diwali. Bookmark the permalink. Liked your way of writing. And in this post..the last line “Love is free” stole the show for me.